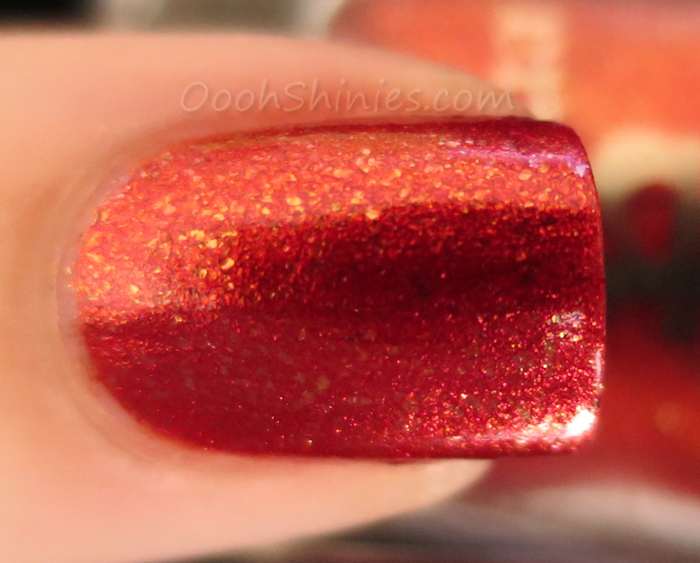 Hey lovelies, here's another Elizabeth & Mary polish for you: Gloriana! And again, no base, 2 coats, with top coat. And yes, this one applied like a dream too, the whole collection does! Gloriana is a red base packed with golden flecks, and I love that golden twist to it! I used my flash to show the flecks better, because in daylight I kept picking up the lighter reflection, as you can see above. Here you can see the different sides of Gloriana, it can look like a red, like a more sparkly red, or it can look like a red packed with golden flecks. What I like and what surprised me, is that it stays red with golden, with the amount of flecks I thought it would look a lot more orange. And it's oh so perfect for the coming holidays!